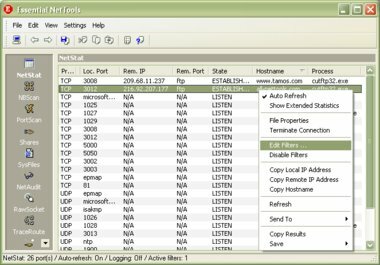 Essential NetTools is a set of network tools for diagnosing networks and monitoring your computer's network connections. NetStat: displays the list of your computer's network connections, information on open TCP and UDP ports, IP address, and connection states. The program can map open ports to the owning application. NBScan: a powerful and fast NetBIOS scanner. This tool features parallel scanning, which allows checking a class C network in less than one minute. PortScan: an advanced TCP port scanner that allows you to scan your network for active ports. This tool features both conventional (full connect) and stealth (half-open) scanning modes. 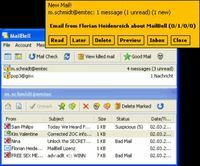 Shares: monitors and logs external connections to your computer's shared resources, lists local shares, as well as allows to connect to remote resources that gives Windows 98/Me users NT user-level connectivity. SysFiles: a convenient editor for the system files: services, protocol, networks, hosts, and lmhosts. NetAudit (NetBIOS Auditing Tool): allows you to perform security checks on your network and/or individual computers offering the NetBIOS file sharing service. RawSocket: provides you with the ability to establish low-level TCP and UDP connections to troubleshoot and test different networking services. 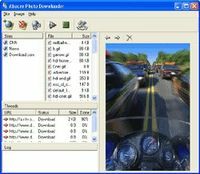 TraceRoute and Ping: these familiar utilities featuring customizable options and a convenient results presentation. NSLookup: allows you to convert IP addresses to hostnames and perform advanced DNS queries. ProcMon: displays the list of running processes. With this tool, you can identify hidden applications, kill running processes, manage your PC's resources more effectively. SNMPAudit: an SNMP device scanner that can discover SNMP devices in the selected network segment and receive customizable data from each of the devices. Other features include report generation in various formats; a System Summary window.